I’ve recently taken up running – I’m still at the probably-would-be-faster-to-walk stage but there’s nothing like a bit of sunshine and fresh air to inspire you to eat healthily! And with weather like this, what better than to have a picnic of Wild rice veggie salad, Old-fashioned lemonade and Pecan pies? Bring a large pan of water to the boil and tip in the rice. Boil according to pack instructions, until cooked. Set a steam basket on top of the water and steam the asparagus and mushrooms for 3-4 minutes until tender. Slice the asparagus and tip into a large salad bowl. Add the mushrooms and remaining ingredients. For the dressing, pour 2 tbsp cold-pressed extra virgin olive oil and 1 tbsp cider vinegar into a jam jar. Add 1 crushed garlic clove, 1 tbsp chopped fresh herbs (I used tarragon, mint and chives) and shake together until well combined. Once the rice is cooked, drain and rinse for 1 minute under cold water, until cool. 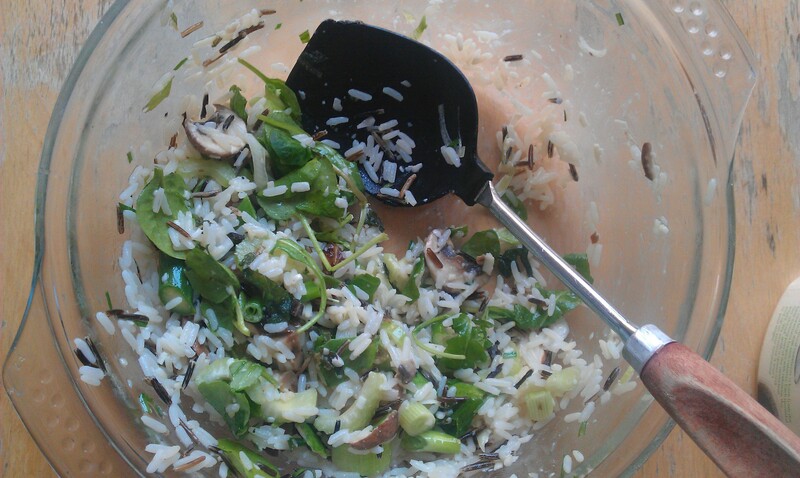 Tip into the salad bowl, pour over the dressing and toss everything together before serving. You need 250ml freshly-squeezed lemon juice – for me, that was from 6 lemons, but adapt as necessary, as it’ll depend how you choose to juice the lemons. I went down the Vitamix/Juice Bag route which also made the juice quite cloudy as it included the pith, so if you’re hand-juicing, you might need a couple more (and your juice will be much clearer). Blend the lemon juice together with 1.25 litres water, around 10 mint leaves, 4 tsp Truvia (or 3 tbsp caster sugar), to taste, and a large handful ice cubes. I like my lemonade quite sour, but if you start with a small amount of sugar/sweetener, you can just keep adding tsp by tsp until you’re happy with it. You will also need a 10cm tart tray – I’d recommend this one from Lakeland. Roll the pastry out to about 1-2cm thick between two pieces of greaseproof paper or cling film (as gluten-free pasty can get a bit sticky). Using a 12-13cm cutter (or bowl), cut the pastry into five circles. Press each circle into the the tart holes, carefully making sure the pastry doesn’t tear. Blind bake the tarts at 200C/Fan 180/Gas 6 and while you’re waiting, make the filling. Beat all of the remaining ingredients together until well combined. Once the tarts are cooked through and lightly golden, divide the mixture evenly between the tart cases. Reduce the oven temperature to 190C/Fan 170C/Gas 5 and bake for 30 minutes or until the filling is golden brown and set. Leave to cool for 15 minutes in the tray (as the pastry will now be very delicate and flaky) before removing. Serve warm with a dollop of crème fraîche or ice cream. Would you like to be updated every time a new post goes up? Enter your email address here and Wordpress will send you notifications.